A specially formulated water-based blend of acrylic polymers that provides both a stain resistant surface seal and a durable low-sheen finish eliminating conventional two-step methods. May also be used as a pre-grouting sealer. Allows moisture vapor transmission and is not affected by ultra-violet light. Use on internal unsealed, porous surfaces such as slate, textured quarry, saltillo, sandstone, Victorian Tile, terra cotta, cement pavers and masonry. Post and Packing £5.50 (Incl.VAT) for 1 litre bottle, £10 (Incl.VAT) for two or more items. Post and Packing £10.00 (Incl.VAT) for 1 or more items. 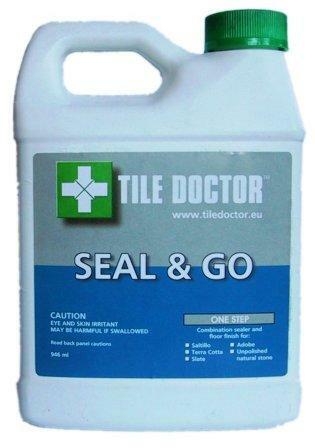 For more information about Tile Doctor Seal & Go Sealer visit www.TileDoctor.co.uk. We were asked by a client who had rented her property out near Spilsby Lincolnshire, if we could restore her very dirty natural flagstone hallway. The previous tenants had subjected the floor to heavy usage and unfortunately it had not been maintained very well. Spilsby is a small market town that has retained its’ character and not changed much since the 19th century. Being about 17 miles East of my base in Woodhall Spa it wasn’t long before I was able to go over and survey the floor. As you can see from the pictures the flagstones were very well used and had lost all their natural beauty. The stone would normally have a lovely mixture of colours and grains showing, as you can see these were nowhere to be seen. I suspect the tenants had been using household cleaners on the floor which tend to strip the protective sealant due to their acidic composition leaving the stone vulnerable. The stone tiles were riven so once the sealant had started to break down the dirt soon becomes ingrained in the uneven surface making them difficult to clean. The client was keen to get the floor looking nice and clean ready for the next tenants to move in so after discussing the process to get the floor looking good again, we agreed a price and booked in a date for the work to be completed. Arriving on the first day, we taped up the skirting and plinth to prevent them getting damaged. A strong dilution of Tile Doctor Pro-Clean was then applied to the stone floor and left to soak in for ten minutes so it could get to work breaking down the dirt and any remaining sealer. Pro-Clean is a professional tile and grout cleaning product that is ideal for cleaning dirty stone tiles like these. The stone tiles were riven (not a smooth) so we used a Rotovac system to get the tiles clean. The machine scrubs the floor with soft brushes whilst simultaneously extracting the soil using self-contained pressurised water. It’s a very efficient way to deep clean the floor and vacuum all the dirty solution away from the floor. It immediately transformed the look of the stone and achieved a 1st class result in removing all the grime and dirt from the stone. The cleaning process went very well and by the time we had finished the whole area looked much brighter. The natural tones of the stone had come back to life and with the application of a sealer they should stay that way for some time to come. Before this could happen however the floor needed to be dry so we the help of a couple of turbo dryers the floor was left to dry off overnight. The following day after making sure the floor was dry by testing with the moisture meter, we sealed the floor with two coats of our natural look sealer Tile Doctor Ultra-Seal. This is an impregnating sealer that works by seeping into the pores of the stone thereby preventing dirt and liquid from becoming ingrained there. The sealer gave the stone a natural look that the client requested, and she was delighted with the end result. Hopefully she will have no trouble renting out the property, the floor now looks stunning!